Since 1996, we are continually provided you with top of the line gable vents and other aluminum products and building supplies. By hiring retired contractors, we are kept up to date on the newest issues you experience on the job site. Our team has the installation knowledge to build you a stronger gable vent and to ease your worries about half round window trim. 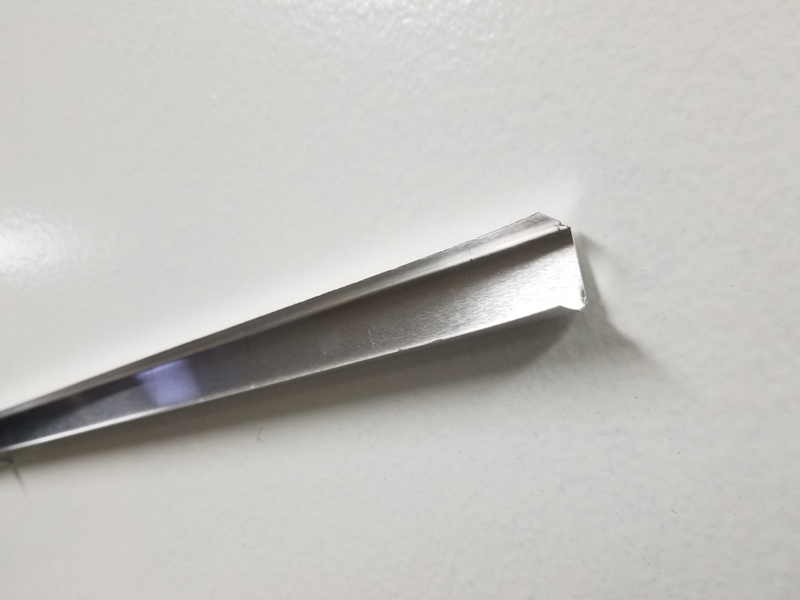 Although we have many machines to do a lot of the manufacturing for us, we still use reliable sheet metal workers to ensure the gable vent you order will be up to your standards. Most of our dedicated team have been in the industry for 20 plus years and are very pleased when you send in your project pictures of your combined work. So, even though these gable vents have been around for some time, the process of manufacturing them can change as new technology becomes available. But, we will never sacrifice quality for price. It should last a lifetime, no less. We stay up to date on all technological advances of a better gable vent. We want you to have the best and strongest gable vent possible. But we don't stop there. When you buy your louver gable vent from our building supplies, your order is processed and given to the shop foreman. He deals out the orders to the specialist best suited for your product. This lessens the chance of a miss made vent. Once the louvered gable vent is ready, it goes to quality control. Each and every gable vent is checked for measures, clean appearance and much more before shipping. We have a rigorous quality control team that will not stamp a gable vent with the name unless it passes the tests. To protect the gable vents from damage in shipping, they are wrapped with low friction plastic and crated for their size. With the best record of safe delivery, Fed Ex will deliver your gable vents to your job or doorstep. The custom sheet metal shop that has become Onyx Xteriors will customize any aluminum gable vent or half round window trim or any other house trim piece you need. We keep everything simple in manufacturing your custom aluminum products with 3 things in mind. Quality products, quick shipping and easy install. Our mission is simple: to provide the best aluminum products and customer service to our customers at the best prices possible. We take great pride in our company, our commitment to customer service and in the products we sell. Our online store is designed to provide you with a safe and secure environment to browse our product catalog. Manufacturing gable vents in triangle, square, round, tombstone, and many more shapes. Our triangle gable vents are the strongest .019 aluminum on the market. 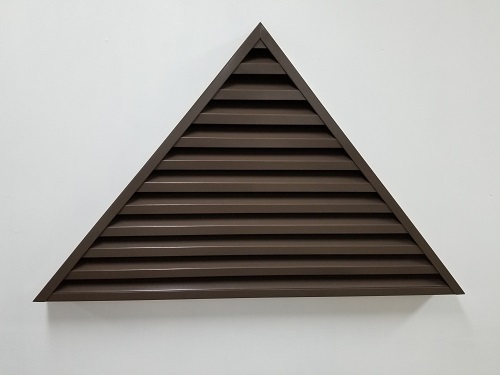 For any louvered gable vents, shop our gable vents department. Half round window trim made of metal, aluminum is here also in our half round window trim department. Want something else? We offer a variety of custom and specialty products. Most all vent manufacturers are still using the track system where the vent louvers get cut straight off and slid into the track. This system was great for then. But this is now. We developed a rail system to lock the louver ends around. It gives the louvers greater strength and locks them into place in case the pop rivet ever gives way. How about 4 flange options for your gable vent? 1. No flange as shown in the picture is great for sliding into a brick opening. 2. 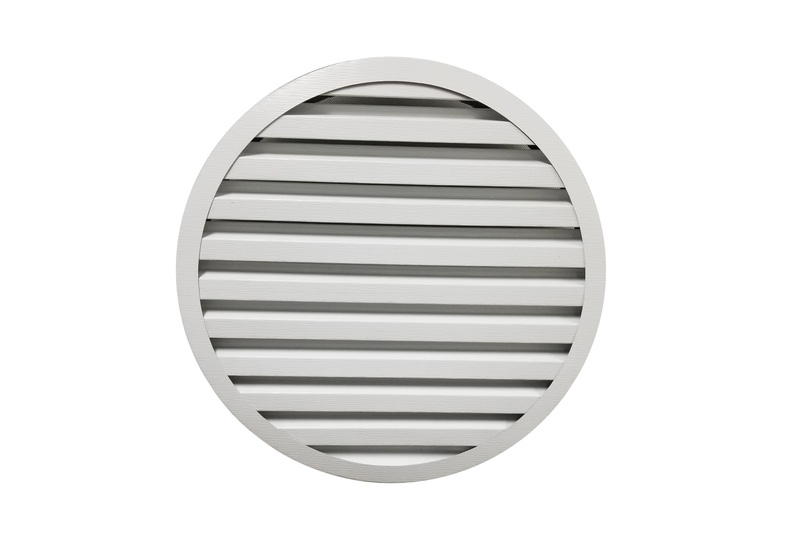 Front flange is the most commonly used on a gable vent because it works with most installs. 3. 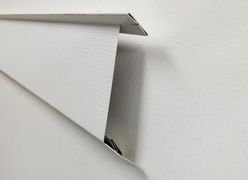 Back flange is perfect if your gable vent is going on a stucco wall. 4. 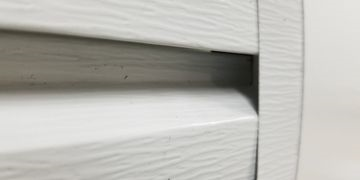 J channel flange is common for siding applications. Wind shear can vibrate the louvers and cause the ends to wiggle till the pop rivet has enough space to pop out of the gable vent. By adding the line of liquid vinyl to the rail system, the louver ends do not vibrate. This adds many years to the life of your gable vent. This technology upgrade is just to ensure your louvered gable vent does last a lifetime. 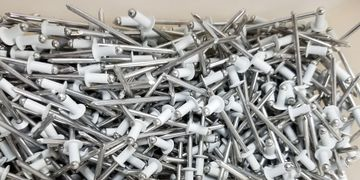 So, why pop rivets instead of just stapling the metal to a wood frame? Obviously the aluminum frame will last longer and the aluminum pop rivets will also. Staples used on wood will rust our and fall apart. No deserving gable vent will be manufactured on a wood frame. If you have ever ordered vent gable louvers from another place, you will immediately notice the weight difference in their vent and ours. This is because we use more aluminum in our louvered vents. On the bottom of the louver you will find four folds of the product. And on the back there is a double hem. If you can get to the opening to measure, this is the best way. Measure straight across the bottom of the opening and then right up the middle. These are the only two measures needed to order your gable vent. If you cannot get to the opening and have to measure the vent, call us with those measures. We have programs to determine the opening size. Copyright © 1996 - All Rights Reserved.